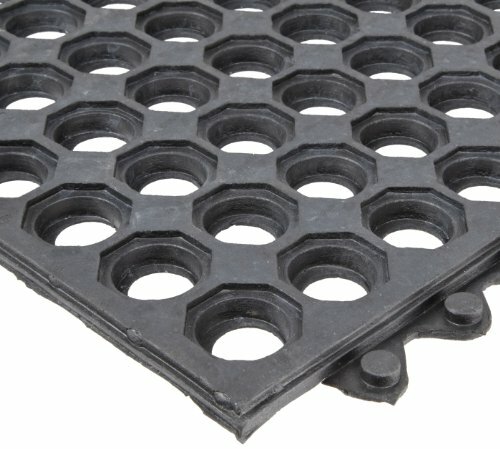 Kempf Anti-fatigue Drainage Rubber Mat for wet areas. 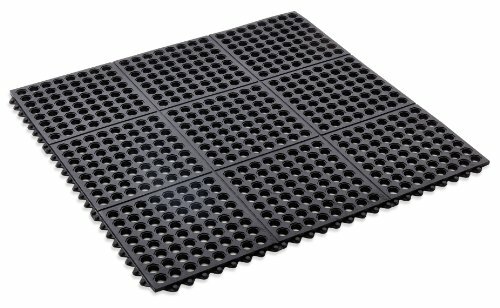 Perfect for the dish area or under the ice machine where floors can get slick, these rubber mats can keep your staff from slips, trips and falls in our service areas. Large hole drainage system facilitates the removal of liquids and debris from work areas and the molded-in beveled edges reduce trip hazards, allowing for easy access onto and off of the mat. Application requirements: flexible configurations, some exposure to grease, oils and water, drainage and comfort, beveled edges for cart traffic, easy handling. 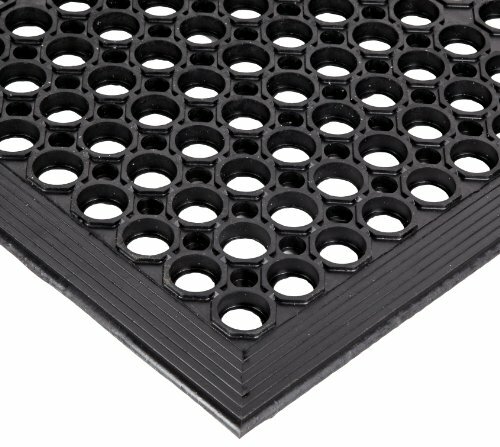 Black rubber mat , with interlocking features, with rounded holes that provide good drainage, soft rubber that creates a anti fatigue effect. Good for outdoor use as well as indoor use. The Workstation Light is an economical, lightweight general purpose drainage mat with built in beveled edge for added safety. The open design allows water and other chemicals to flow through the mat so you have a safe dry standing surface. Available in Black General Purpose or Red. Grease and Oil resistant. NoTrax Bristol Ridge features a lighter-weight double rib high/low design that performs the scraping function of the mat. The ribbed surface brushes, channels, and conceals dirt and debris and is the perfect choice for light to medium traffic areas. Application requirements: good water absorbing qualities, aesthetically pleasing and functional. Measures 4-feet length by 3-feet width by 3/8-inches thickness. Midnight color. NoTrax Ultra Mat general purpose rubber safety/anti-fatigue mat for Wet Areas. 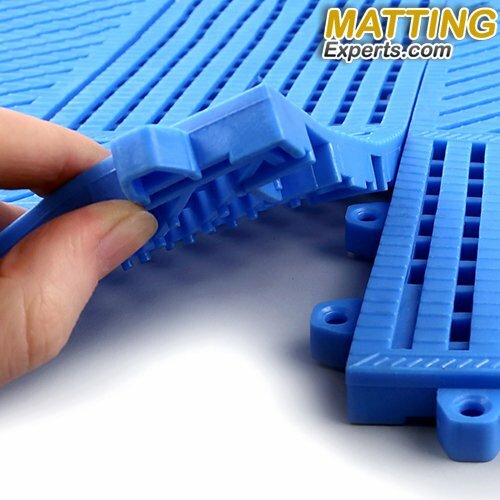 Ultra Mat is a light weight modular anti-fatigue mat system with molded-in mat connectors for easy on-site custom configurations and longer lengths. It's large hole design provides excellent drainage removing liquids and debris from the worker platform and it's lightweight construction makes it easy to handle. Ultra Mat is general purpose rubber compound depending on your grease and oil protection requirements. Application requirements: flexible configurations, some exposure to grease, oil and water, drainage and comfort. Measures 3-feet length by 3-feet width by 1/2-inches thickness. Black color. 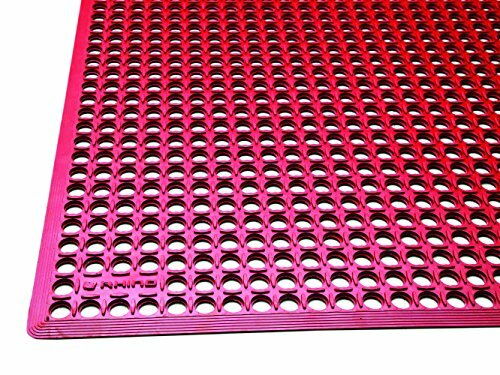 Sanitop large hole design with built-in ramps offers easy handling as well as safety/anti-fatigue benefits in grease resistant black or grease proof red rubber mat. casa pura Premium Entry Mat | Entrance Mat Comparison Test Score: Very Good (A-/1.3) | Ideal as Front Door Mat or Entry Rug | Blue - 16" x 24"
The rhino K-Series comfort tract is a brand new innovative rendition of the standard commodity drain-thru Workstation mat. Made the from worlds purest tree derived virgin rubber, the K-Series comfort tract features a new light weight design, upgraded anti-fatigue support, wider holes to encourage better drainage, with a raised cross-bars on the back for much improved air circulation. This product offers all the benefits of natural rubber: high resilience, high tensile strength and tear properties. 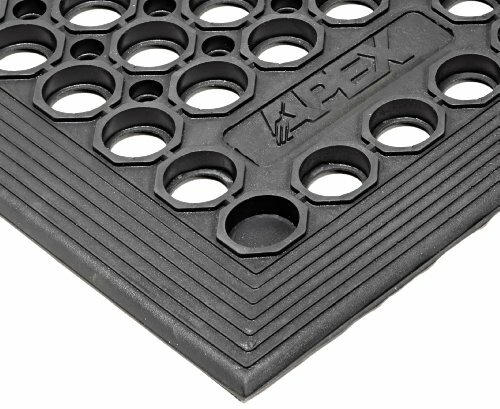 Perfect for all industrial, commercial, applications, this universal mat stays in place and provides great cart access as well. 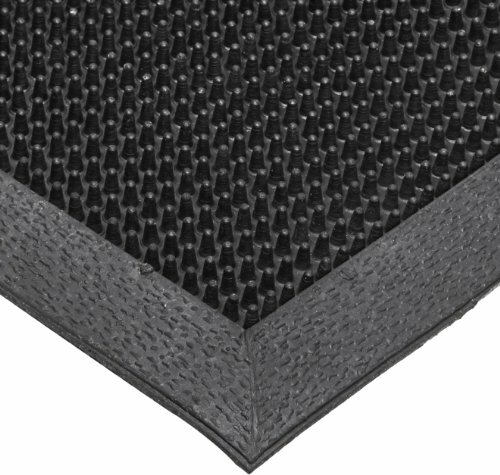 NoTrax Finger scrape mats are constructed of tough SBR rubber to remain flexible while withstanding extreme cold. Thousands of tough, flexible rubber fingers sweep shoes clean while suction cups on the underside of the mat help to minimize shifting. 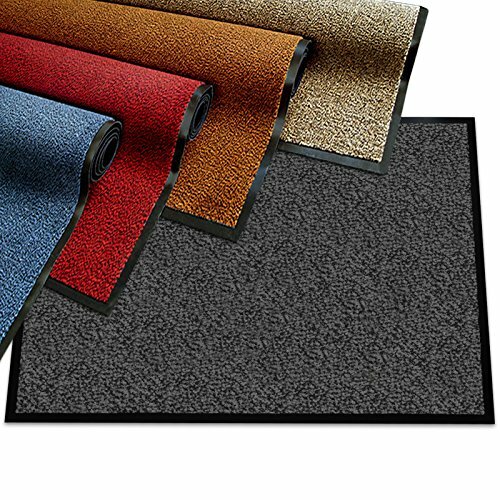 Due to its durable construction, Finger Scrape is the perfect year round outdoor entrance mat for schools, municipal buildings, plant entrances, and office buildings. Slip resistant surface. Molded rubber bristles grab and hold dirt. Molded beveled edging on all 4 sides creates a retention dam to trap moisture while reducing trip hazards. 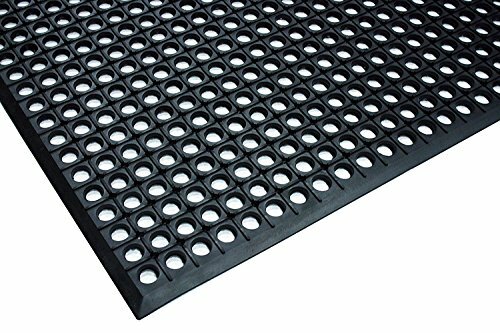 Suction cups on the underside of the mat reduces mat movement. Application requirements: keeps moisture and debris outside, withstands elements, anti-slip and outdoor. Measures 32-feet length by 24-feet width by 3/8-inches thickness. This wet area mat is perfect for pools, gyms, spas and more. 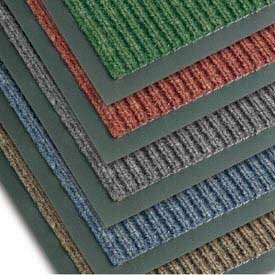 Compare prices on Wet Area Mats at ShopPlanetUp.com – use promo codes and coupons for best offers and deals. We work hard to get you amazing deals and collect all available offers online and represent it in one place for the customers. Now our visitors can leverage benefits of big brands and heavy discounts available for that day and for famous brands.